The Writing Bug: The Top 5 reasons to ask yourself what would JK Rowling do? The Top 5 reasons to ask yourself what would JK Rowling do? Oh it's Friday and I'm excited. I have tickets to the final Harry Potter movie tonight. Since I'm switching it up and nixing the round ups I thought I'd give cred to JK Rowling today. I know, many blogs gush over JK. It's JK this and JK that. But as writers, we can learn a lot from JK both in her publication story and her style. Some people live their life by the motto: What would Chuck Norris do? When writing, I think you can apply JK. Here are the top 5 reasons to ask yourself what would JK Rowling do? She believed in her idea and persevered. It was six years from when she started writing Harry Potter till her story was picked up by Bloomsbury Press. And according to the extras on her website she rewrote her first chapter of Sorcerer's Stone many, many times. So hang in there, you can do it. She got an agent. Contrary to urban legend (I've heard some big ones), JK Rowling submitted her work to agents. Sure, she was picked up by the second agent she queried (I sorta hate her right now) but it still took her agent a full year to sell the manuscript. Which goes to show, even great stories need an agent and a bit of luck. Work toward getting an agent, they make the publishing life easier. She has great style. As a writer, you can learn how to write well from reading the Harry Potter series. Kidlit shows how JK Rowling tells then shows and does it well. Nathan Bransford points out five tips from reading Harry Potter. Writing style and voice, she has it, you need it. Write, write, write, study, study, study. She gives back. JK Rowling's Wikipedia page has a whole section on her different philanthropic efforts. Rowling said, "I think you have a moral responsibility when you've been given far more than you need, to do wise things with it and give intelligently." It's important to remember your community and those in need, so remember. She can shake up the industry. With her soon-to-launch website Potterville, she's cutting out the e-book retailers and selling directly to her fans. While most authors should still use the tradition channels for distribution, JK Rowling's move is gutsy and may influence the direction of publishing. Maybe her efforts will make publishing easier for us, or not. Either way it will be fun to watch how it plays out. 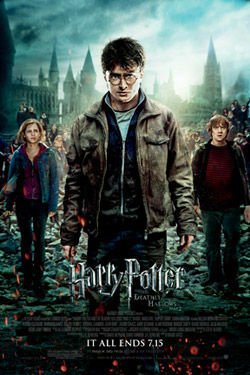 I love Harry Potter and the Prisoner of Azkaban. I have a special place in my heart for the second and seventh books, the second because it scared the life out of me and the seventh because I think it's her best example of storytelling in the whole series. I love how her writing has matured with her audience and how she's still the same person she was when she first started. I have tickets for today too, which means I should get off the Internet and into my taped, round glasses. Prisoner of Azkaban was also my favorite book, and I loved the movie. It was darker than the rest. Sirius Black was the best character...I hated that she killed him off. It's good to know that such a famous author had her struggles to ge there too. Prisoner Of Azkaban for me, as well, both the film and the book. It's funny, because I had completely dismissed Harry Potter as just another children's book until I randomly saw PoA in theaters. Then I thought, "Time travel? Dementors? This is pretty cool." And so I went home and read the books. To me, JK Rowling simply created an interesting, entertaining story. Just fun. I've only read her first book, but enjoyed it even though I'm not a fantasy fan. Thanks for pointing out all the things to learn from this amazing author. Great post Brooke. I am going to go see the movie tonight and I can't wait. I would have to say the first book is my favorite because it launched me into the world of Harry Potter and I have a been a fan ever since.